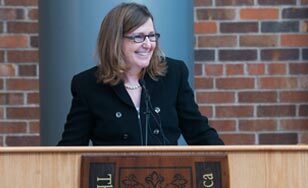 Dr. Colette McCarrick Geary will become the 12th president of The College of St. Scholastica, effective July 1. She was introduced to the St. Scholastica community on April 1 at a ceremony on the Duluth campus. "Dr. Geary was the candidate most favored by the students, faculty, staff, Benedictine Sisters, alumni and all the St. Scholastica community following her visit to the Duluth campus in February," said Mary Ives, chair of the Board of Trustees. "She was the unanimous choice of the search committee and earned unanimous support of the full Board of Trustees. She was recognized for her strength in strategic planning, collaborative management style, and commitment to Catholic liberal arts education." Geary, 55, comes to St. Scholastica from The College of New Rochelle in New Rochelle, NY. She served as Senior Vice President for Strategic Initiatives there starting in 2014. She joined New Rochelle in 2010 as Vice President for Student Services. "I am grateful for the strong support of the Board of Trustees and senior leadership as well as the students, faculty, staff and alumni I have met so far," Geary said. "Thank you for your confidence and for all your positive energy. I am eager to put my experience, values and skills in service of this remarkable college." She will succeed Dr. Larry Goodwin, who is retiring at the end of June after 18 years as president. Geary said a bit of history helped her appreciate a legacy of the leaders before her. "Mother Scholastica Kerst, the first prioress of the Benedictine Sisters of Duluth, said that she dreamed there would someday be buildings here, in which higher education would flourish. Today, St. Scholastica is poised for a new level of flourishing. I am excited to have the privilege of joining this learning community at a dynamic time. I know that I will begin my service with a solid foundation thanks to the leadership of Dr. Larry Goodwin." Geary holds a Ph.D. in Psychology from Stony Brook University in Stony Brook, NY, a B.S. in Psychology from Manhattan College in the Bronx, New York City, and is completing an M.A. in Theology at the University of Notre Dame in South Bend, IN. "Dr. Geary is an excellent match for The College of St. Scholastica for many reasons," said Jessica Durbin, co-chair of the presidential search committee. "She has a deep understanding of the Catholic intellectual tradition and a real commitment to both the liberal arts and professional programs. She is a strategic thinker who appreciates our entrepreneurial culture. And she shares our strong commitment to inclusivity." An inauguration ceremony will be held this fall. At The College of New Rochelle, Geary led implementation of a strategic plan, working across six campuses and four schools. She also oversaw the Office of Mission and Ministry, which promotes mission-based commitments in the life of the college, key elements of which include an emphasis on the value of the liberal arts; a special commitment to the education of women; expanding educational access to populations historically underserved by higher education; and an emphasis on life-long learning. Earlier, Geary had worked at Manhattan College in Riverdale, NY, as Dean of Students. She taught in the School of Education graduate programs for 11 years. Prior to her work at Manhattan College, Geary was Staff Psychologist and Unit Director at the Department of Veterans Affairs Hospital in Montrose, NY, and had a private practice specializing in cognitive-behavioral approaches to the treatment of psychological disorders. She and her husband, Michael, a criminal justice professor, have three daughters: Brianna, Cailean and Mariah. The nationwide search for St. Scholastica's 12th president began last year after Goodwin announced his plans to retire.